Our free printable 2019 monthly calendar and planner is here! I can’t even begin to tell you how excited I am to release this new planner. It includes over 40 pages of 2019 planner printables in the most gorgeous floral theme! Let me set this straight – if you’re looking for a planner that’s delicately feminine and elegant, I’m pretty sure you’re going to love this one. So beautiful! Keep scrolling to see it for yourself! Ahhh, it’s another great day today for all the Shining Mom readers out there! I know you’ll be extra delighted with our new freebie. Since it’s going to be 2019 in no time, I thought of already sharing our prettiest and daintiest planner yet that I’ve been working for in the past days! But before I hand the new planner to you, I would like to thank you first for the massive success of the 2018 edition. It’s ranking high on Google and trending like crazy at Pinterest, pinned by thousands and thousands of you! I am so blown away by all your heartwarming feedback and overt-the-top grateful for your warm support at the same time! Because you love the past edition oh so dearly, I made sure that your free printable 2019 monthly calendar and planner will come out just as beautiful. Something that you are also going to love just the same. And so this year, I worked my heart out to create your free printable 2019 monthly calendar and planner, and I thought of giving it a name. Introducing… “The 2019 Beautiful Life Planner”… a simple, practical and insanely gorgeous planner that will help you make your every day organized and of course, beautiful. How Will You Make Your Day Beautiful Today? Well, that simple question will serve as your guiding light each day while using this planner. Begin your day by asking yourself how you’ll make it beautiful. Then, start writing down the goals and tasks you are to perform. Start your day right and be more intentional. This will help make your days more blissful and beautiful! Your FREE Printable 2019 Monthly Calendar, Life Planner and Blog Planner! 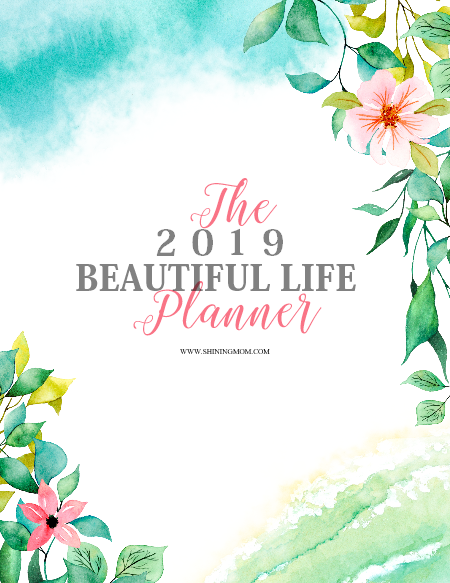 The 2019 Beautiful Life Planner is divided into three categories namely: Life Planner, Blog Planner and Monthly Calendars. A shout out to Denise Anne of Design Cuts for the floral elements I used in designing this lovely planner! Let me give you a sneak peek to the planner so you can view some of the pages included. Ready your printer, you’ll have a beautiful DIY planner project to make! Meanwhile, please note that the planner files are chucked according to the categories mentioned. But should you like to download all of them in one single file, get the copy towards the end of the post (with bonus pages included). The Life Planner 2019: Plan Blissful Days Ahead! The first section called The Life Planner holds the basic essentials that will help you run your life planned and blissful. It includes truly practical and functional sheets that will help you set your yearly goals, monthly priorities and daily to-do’s. I am pretty sure you’ll find these easy-to-use pages practically useful. You can easily snag this first section (out of 3) of the planner right over here. The Free Printable Blog Planner 2019: Skyrocket Your Success! Next up is my favorite section of the planner, The Blog Planner! Calling my fellow bloggers out there, this one is for you. It’s about time that YOU skyrocket your blog! Let’s work hand in hand to spread greatness in this crowded world of blogosphere. Let’s continue to spread love and inspiration to our readers. Let’s continue to build each other up! Instantly get this blog planner here. And Oh, even if you’re not blogging, you too can find planning sheets in this section that you can practically use every day! 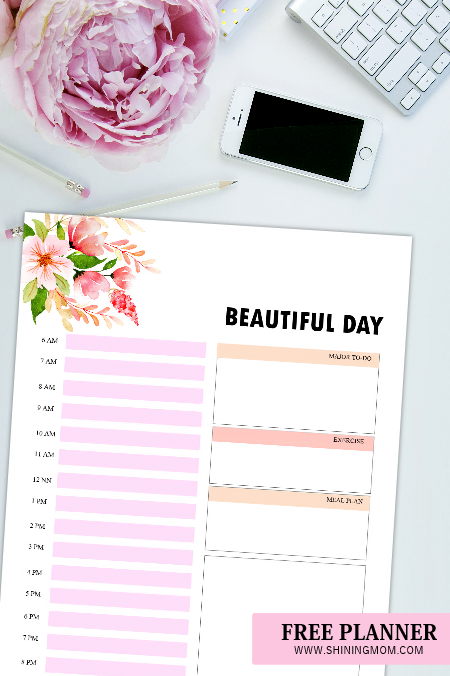 The Free Printable 2019 Monthly Calendar: Simply Stunning! And we’ve reached the most darling section of the planner— the free printable 2019 monthly calendar! If you’re anything like me who loves calendaring and organizing schedules on pen and paper, you’re going to enjoy this! The monthly calendar section of The Beautiful Life Planner 2019 includes all the months of the year from January to December. Each monthly planner comes in gloriously beautiful florals! They all come blank for more versatility and more room for your notes! Best of all, they come in Monday and Sunday week start because I know you have different preferences. Get the blank calendars here. Oh, if you’d like to see more calendars and planners for 2019, I do have lovely options at my store. You might want to check out our top planner, The Success Designer Planner. This is an ultimate productivity and goals-focused planner that will help you plan your success. For dated calendars, perhaps you’ll love to see this charming and dainty floral calendar or this classic minimalist calendar. 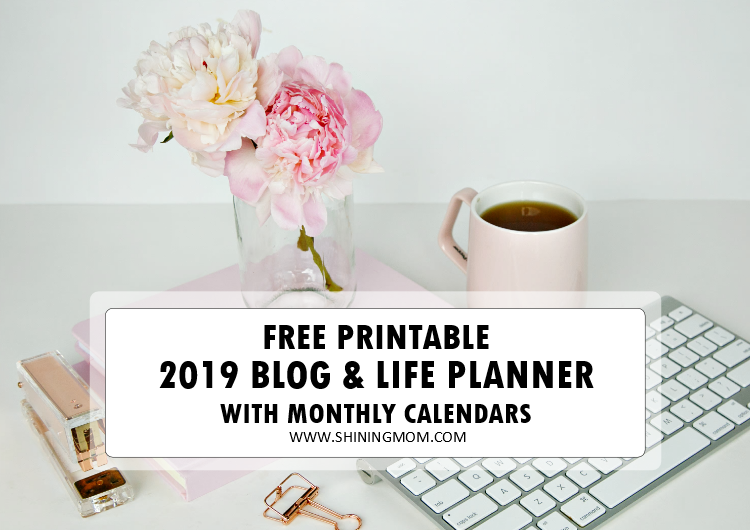 Get Your Free Printable 2019 Monthly Calendar with Life and Blog Planners in One Single File with Amazing Bonuses! Receive the 40-page file sent straight to your inbox by joining the over 30,000 Shining Mom newsletter subscribers. You will also receive freebie updates from the Shining Mom blog! Yup, you’ll never miss a freebie from us again! Click here to join the mailing list, to receive your free planner. Print the planner in US standard Letter size paper with 8.5″x11″ dimensions. You may also use A4 sheets, just be sure to adjust your printer setting. Enjoy your free 2019 planner printables! Help spread love. Pin this Post! But wait!! Does anyone here want to have this gorgeous free printable 2019 monthly calendar in dated format, too? Let me hear you!!! Go ahead and let me know at the Comments should you like a dated version of the free calendar shared here. I will automatically update this post with a link to the dated PDF file in Sunday and Monday start if I receive 40 requests! Easy peasy and it will be oh so fun and lovely for us to connect! Game? Editable Calendars: 2019 Calendars in MS Word! Cute Calendars: 2019 Calendars in Fun Nautical Print! That’s all for now! I pray that this free printable monthly calendar and planner will bless you. Cheers to a beautiful and bountiful 2019! « Free Printable Thanksgiving Cards: 10 Beautiful Designs! I would love a copy of this. I just joined your email list and look forward to reading your letter. On the downloaded file, November is missing 🙁 just letting you know! I would love a dated copy when you make it, I’m joining your mailing list. Thank you for taking the time. I like so much your calendar, i would love to have it. I would love the dated version of this calendar! Planners + calendars = Perfect year! Nice one! I LOVE your work. Thank you so much for all you do. I would love dated versions as well. I appreciate the undated ones but also love dated ones. Your florals are awesome. I enjoy pretty and its not out there much any more. I really love my success designer printable. I would love a dated copy! Hi. I used your last year printable all 2018 on my fridge. It brought me happiness each time I saw it. I would love to get the 2019 version and of course, I am subscribed. I love the floral planner and I would like a dated one. Please let me know if that is available. Thank you.